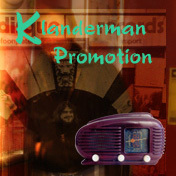 Robbie Klanderman, the authentic music promotor. In the Netherlands, Belgium and beyond. Do you have something to send through the mail? Please contact me via e-mail or phone to ask for the postal address. For mailinglist (un)subscription, updating your contact info, or other matters, please use the reaction box below. For mailinglist (un)subscription (mostly in Dutch), updating your contact info, or other matters, please contact me via e-mail or phone.